​Anthony Davis has long been linked with a move out of ​New Orleans, with recent headlines suggesting that the power forward would ​team up with LeBron James in Los Angeles. Despite all the ​rumors circulating, Davis has been focused on his game and trying to help the Pelicans improve. 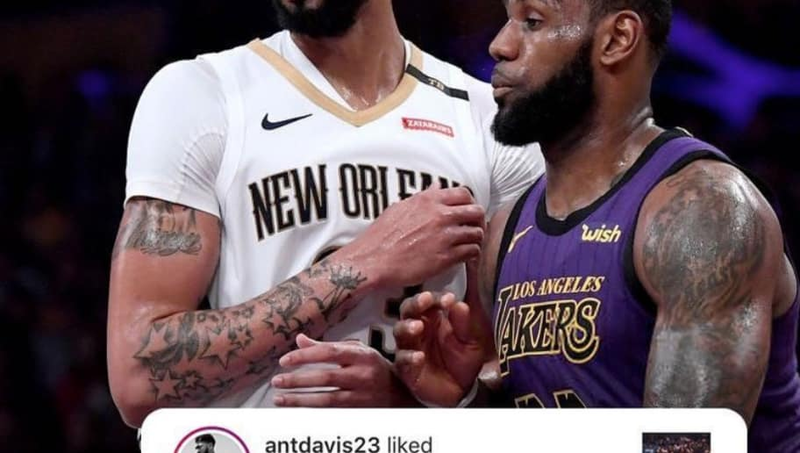 His latest social media activity may dissuade the ​Lakers fans who think it's only a matter of time until he joins the team, as Davis was seen liking a comment that was anti-LA. The comment read, "@Lakers HE HAPPY HERE, HE EAINT GOING TO YOUR BUMB ASK CITY!!!!" Instagram user @chandler_billiot24 was the one who left the comment and despite him making a few grammatical errors, Davis clearly enjoyed what he had to say. The Lakers are doing well for themselves even without Davis on the roster. They currently occupy the No. 8 seed in the Western Conference and should rise through the standings when LeBron James returns from his groin injury. Davis has been unreal this season for the Pelicans, averaging 28.9 points, 13.2 rebounds, 4.4 assists and 2.7 blocks per game. He's also making a career high 0.9 3-pointers per game at a 32.1 percent clip. Despite all he's done on the court, the Pelicans have struggled this year. They have a 20-22 record through the first half of the season and are in 12th place in the Western Conference. Davis would never admit it, but perhaps the superstar big man should be interested in parting ways with the Pelicans.